I am short 100 shares AAPL at $177.68. I’ll take 50 shares off the table at the recent low of $170, and the other 50 if the stock reaches the November low of $155. My stop is above the 50 day moving average, around $183. It’s always tough to short a stock like AAPL. However, the stock has broken down below the 50 day and volume shows major distribution. Update: I did not know that that Mac World is tomorrow. A reader pointed this out and I probably would not have entered had I known. Should have check the news before entry . . .
Dont forget MacWorld is tomorrow. 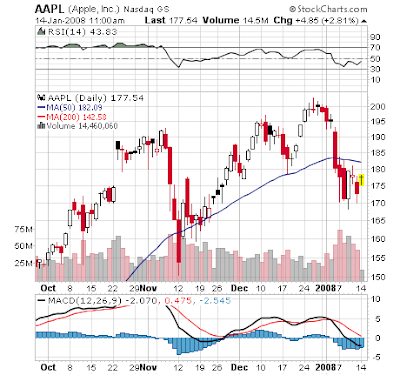 AAPL could bounce. MS, time to add “Quick scan of headlines” to your checklist, prior to entering your positions. First, MON earnings, now AAPL! MacWorld has been ALL the news related to AAPL in the past 2 weeks. Anyways, I too will be looking to short AAPL after MacWorld and earnings are out this week. Even AAPL will not be able to weather a consumer slowdown in spending. Also, a lot of folks will be “selling the news” once the market downtrend continues. TVH: You are right about scan the headlines. I usually go over to yahoo finance and do a quick check. My bad today.thanks upside.